Well, not really. But oval diamond engagement rings do create a sort of "magical illusion." It’s a popular notion that oval diamond engagement rings enhance the appearance of slender fingers – making them appear more graceful and elongated. Some jewelers say that oval diamond engagement rings also have a slimming effect on fatter fingers. Why are Oval Diamond Engagement Rings Slimming? It’s a trick of the eye. When there’s miscommunication between your eyes and brain, an optical illusion can occur. Optical illusions work best when they incorporate geometric shapes and lines. An oval is a geometric shape, similar in appearance to a regular circle that’s been slightly stretched. When you look at oval diamond engagement rings, your eyes are drawn to the elongated, slender shape of the oval. This causes the eye to misinterpret the size of the finger, making it appear more slender and elongated. Your first step should be to select the perfect oval diamond from our web site. Oval diamond engagement rings aren’t as popular as traditional round, princess, or marquise diamond engagement rings. However, they aren’t any less beautiful. 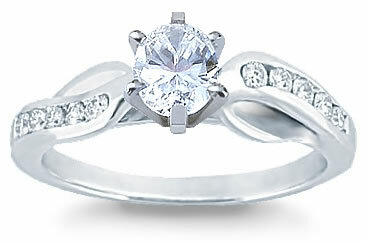 Oval diamond engagement rings are usually set using two or more smaller gemstones situated around the center gemstone. It’s actually the most recommended setting for a three-gemstone style. Oval diamond engagement rings can make use of a solitaire setting, but it’s not a popular choice. Oval diamond engagement rings can also be enhanced by the wedding band. Remember, your wedding band can be as plain or as flashy as you choose. In fact, you can surround your oval cut gemstone with gemstones cut into different styles. For example, you can have an oval cut gemstone as your center stone, but use round, marquise, or princess cut diamonds as embellishments. Alternative gemstones also offer extra design options for oval cut engagement rings. Just because your center gemstone is a diamond, doesn’t mean the side-stones have to be. If you don’t want to add more diamonds to your ring, then consider using garnets, rubies, or other precious stones on the side. Instead of going for a plain silver or gold wedding band, consider something more exciting. Think about having some significant words or dates engraved into the band. Add your name, the name of your significant other, or both. Or choose a band with decorative accents carved into the metal. You can even opt for an oddly shaped band. As you see, oval diamond engagement rings can be enhanced. Oval diamond engagement rings are the perfect choice if you want your fingers to appear slimmer. With a bit of creativity, you’ll create the perfect engagement ring. If you need help finding the perfect oval engagement ring or any engagement ring for that matter, give us a call. We would be glad to help. You can contact us at 1-877-877-4141 toll free.